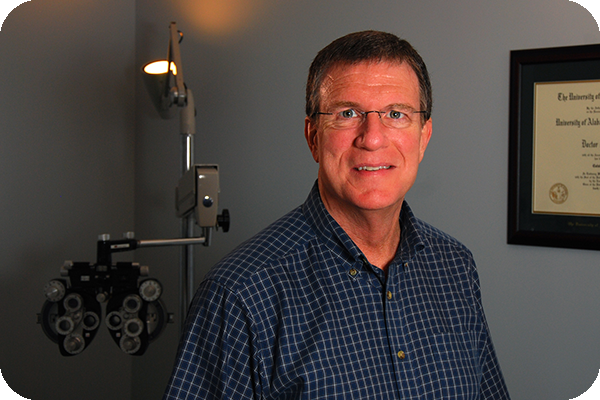 Dr. James Fisk had two careers before becoming an eye care provider. After receiving a B.S degree from Eastern Nazarene College and a Ph.D. from Duke University (both in chemistry), he worked in the analytical instrumentation industry in Houston, Texas for several years. Tired of living out of a suitcase and the Atlanta airport, he moved to Birmingham in 1984 to teach at Samford University. For thirteen years, he was both a professor of chemistry and the health professions advisor. Feeling the need for a change in direction, he took his own advice and left SU for the UAB School of Optometry, earning the Doctor of Optometry degree (O.D.) in 2001. He stayed an additional year to complete a residency in family practice optometry then opened Vestavia Eye Care with Dr. Essinger in 2003. In addition to caring for his VEC patients, Dr. Fisk has provided fill-in optometric services for patients in over thirty-five eye care practices in north and central Alabama. Since 2007 he has also taken care of veterans at the Birmingham Veterans Affairs Medical Center. His hobbies include making home repairs and his passion is great choral music written for the glory of God. He has two grown sons (of whom he is very proud).